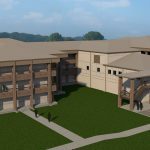 The H-Frame Barracks Renovation is a Design/Build Project with Engineering Design Technologies (EDT) as the General Contractor. The four buildings were four separate task orders competed on, and awarded to, EDT through their Fort Worth District Corps of Engineers Small Business MATOC. SLA Architects provided architectural services to EDT. The purpose of the renovation is to improve energy efficiency and provide a better living environment for the soldiers that will last for the next twenty years. The projects consisted of the complete interior and exterior renovation of Barracks B9210, B9211, B9213 and B9214 along with a Central Energy Plant renovation. In selective demolition of the barracks, all interior spaces were gutted in the structure except at the COF areas which received patch and repair. The utilities were removed with the exception of provisions for general lighting. Other improvements consisted of providing a new fire protection system with an approved automatic sprinkler system; re-mediating major uneven floor slab settlement issues on the first floor of the barracks buildings; minimizing vapor transmission through the building envelope, improving energy efficiency, providing dehumidified make-up air to provide proper space relative humidity, sealing of building envelope to minimize infiltration; and providing consistent and proper chilled water supply temperatures. Design is complete with the construction to be completed in September 2018.